This year was an amazing year for growing tomatoes. Here it is almost December and my crop of Sweet 100's is finally at an end. Every year I plant two or three of these prolific producers. Once they start producing clumps of sweet little fruits, they keep it up until the weather calls it to a close. Mid-October is usually the end of the season when the weather starts to get cold and sharp rains split the fruit, but this year they held on until about a week ago. Heavy rain and cold mornings called an end to our party. 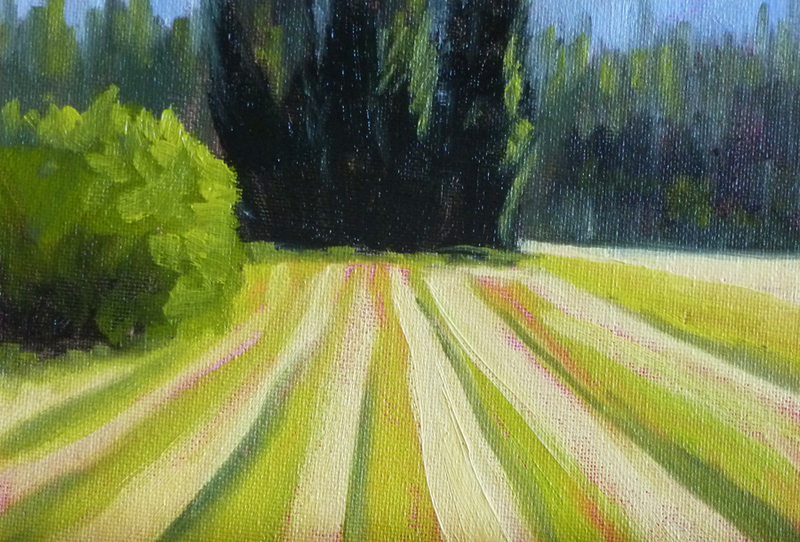 This little 5x7 inch oil painting pays tribute to these wonderful plants. 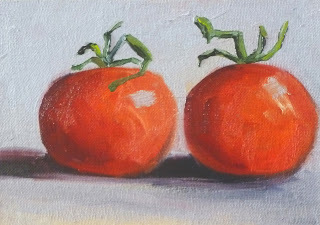 This painting has SOLD, but you can visit my Etsy Shop to view more of my small fruit paintings. Recently I've been reading about the disappearance of family farms in America. As a life-long suburban dweller, I finally recognize why so many people like paintings of farm land and barns. We want to pretend that somewhere an idyllic family farm is ready to supply an escape from our hectic modern lives. We want to believe that some day we will be able to raise our own food and our own livestock. It is a nice dream. 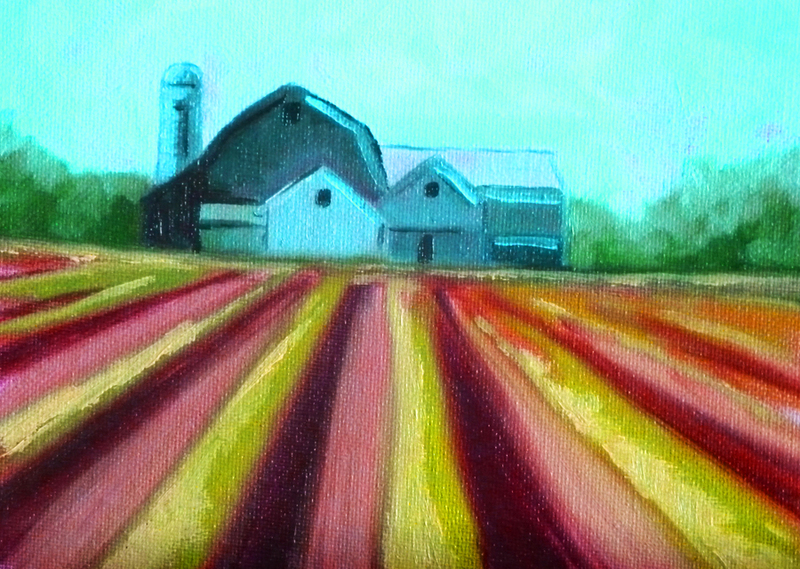 It makes me happy to paint barns, farms, and freshly turned fields that will help to fuel our fantasies of a quaint agrarian society. 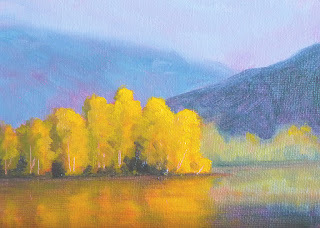 For anyone who would like to plant a piece of this dream in their home or office, this little 5x7 inch oil painting can be purchased from my online art gallery, Small Impressions Paintings. Visit here to view the painting in the gallery or make a purchase. He looks suspicious. I'm sure he's done something illegal--something like theft--something he doesn't want anyone to notice. At least, that's how these fellows tend to look when they stop by my backyard. 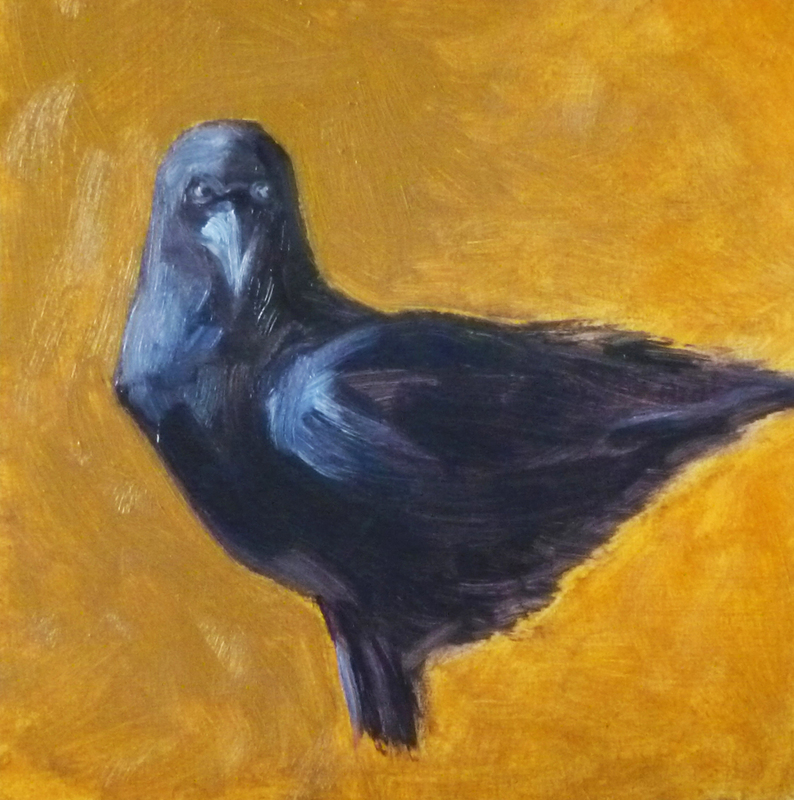 This painting was inspired by a crow standing knee deep in dried grass and looking like the guilty animal he is. The painting is 6x6 inches on a gessoed hardboard panel. It has SOLD, but other paintings of crows are available in my Etsty Shop, Small Impressions Painting. Click this link to see my paintings of birds and animals. Most of these lovely golden trees have disappeared for this year. Wind, rain, and now the threat of snow have obliterated the lovely color of fall and all that is left is a fond memory of crisp golden days. This little painting is for sale in my Etsy Shop. Click here to view it in the shop or make a purchase. This weekend was the first winter storm of the season. With a lot of wind and rain, I am reminded of the windbreaks of rural America, designed to slow down the gush of a wind. This little 5x7 inch oil painting inspired by a country windbreak is for sale at my Etsy Shop, Small Impressions Paintings. Click here to view it in the shop or make a purchase. 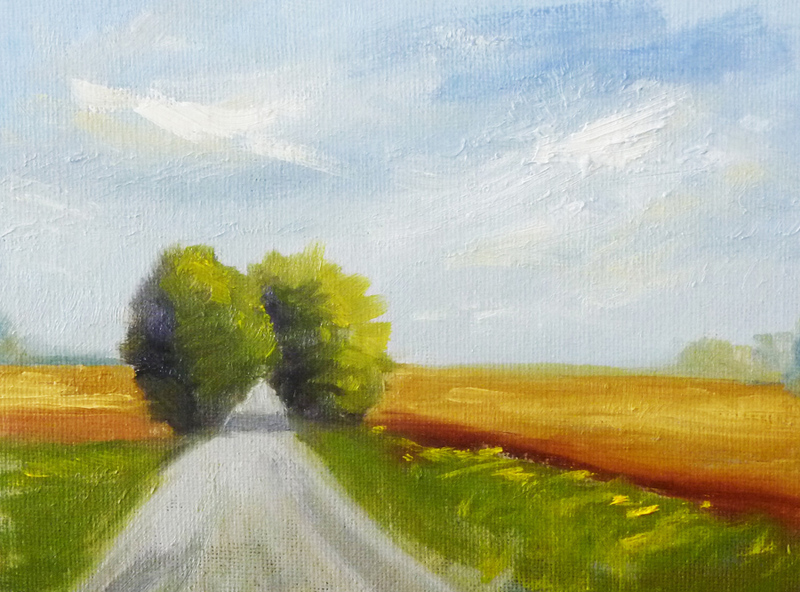 When I painted this 6x8 inch oil painting, blue skies were dominating my thoughts. Big blue skies and warm weather sound so inviting on cool November days. My dreams are of leaving the cold, dampness of the Northwest and heading to a warm place where the skies are blue and I don't need a raincoat. The painting is for sale at my Etsy Shop, Small Impressions Paintings, and can be viewed or purchased by clicking here. It is clear that the cool damp weather has arrived. It took almost two weeks for the paint to dry on this 8x10 inch oil painting. 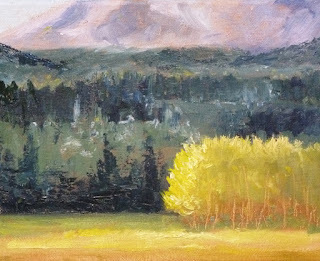 Oil paint is naturally slow to dry, but when winter arrives, it feels like forever. There is quite a bit of heavily textured paint on the autumn trees, nevertheless, I am impatient. Now that it is finally dry, I've listed the painting for sale at my Etsy Shop, Small Impressions Paintings. Click here to view it in the shop or make a purchase.